Of the musical highlights at last Saturday’s “Local Legends” awards night – there were many – what stood out most wasn’t on stage. It was the crowd – more to the point, the audience, focused on the performers. What a treat to see so many great bands on a big stage, without the clatter of plates being cleared, dinner being served or oblivious patrons talking over the music. It was a memorable evening, and hopefully not the last. The players were clearly inspired by these trappings. Early on, Rich Meijer spun off one crackling guitar solo after another, gathering steam each time the crow roared. Meijer led the house band, which grew larger with each player’s set. Harp and harmony from Jed Dickinson perfectly complemented Dave Clark’s songs. A conga and timbale player joined Pete Meijer for a Springsteen-like turn, with Matt Getman playing Big Man to Meijer’s Boss on the saxophone. A Gully Boys quorum followed, with Bill Temple, barefoot in bib overalls, singing from his heart. During Dr. Burma’s set, lead singer Linda Boudreault prowled the stage like a lioness, her long ponytail swaying, chewing up the real estate. Pete Merrigan called it a “family reunion of folks who’ve never met,” and watched with a smile from the wings for much of the night. Arguably, though, the night belonged to a pair of youngsters. Avi & Celia’s soulful set brought the house to its feet, whooping and hollering. Singer Celia Woodsmith dug low notes from under the floorboards and shot them into the stratosphere with operatic flourish, her entire body moving in emphasis. Celia’s cowboy boot stomped the stage, and the entire building shook. 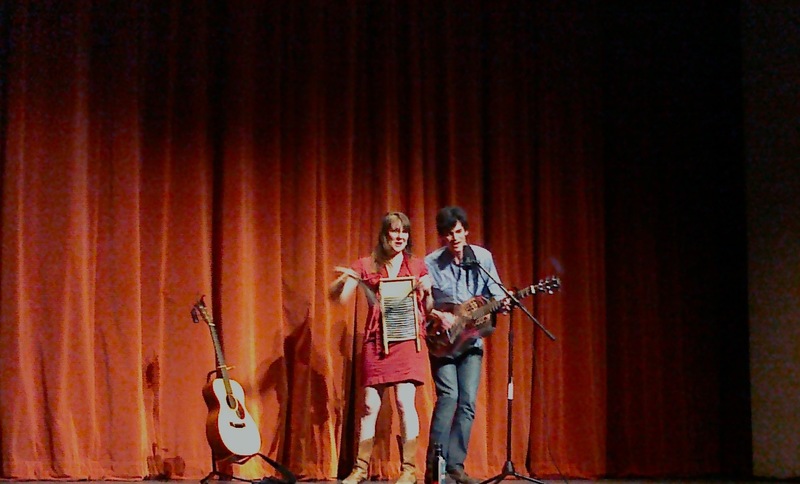 With Avi Salloway on resonator slide guitar, the duo played like a delta blues version of Gillian Welch and David Rawlings. Celia scraped and drummed a washboard wearing evening gloves customized with steel fingertips for a rousing rendition of Dylan’s “It Takes A Lot To Laugh (It Takes A Train to Cry)”. An astounded audience did everything it could to bring them back for an encore. Of course, the biggest hero was event organizer Dave Clark, a man on a mission to champion local music. Without his energy, or his invaluable http://www.yellowhousemedia.net web site, the scene would be much poorer indeed. Thursday, Dec. 24: Watch Television at Home – No one’s going out tonight, unless it’s to church. That’s just how it should be, but there’s still music to enjoy. If you have high definition, check out Christmas shows from Brian Setzer on HDNet and Melissa Etheridge on Palladia. GAC and VH1 Classic are both running holiday music videos for most of the evening. For country music fans, PBS has Faith Hill in concert – or you could just watch the video fireplace. Friday, Dec. 25: Bill Temple, Casa del Sol – The longtime Gully Boy leader plays solo in Ascutney. The Mexican cantina has regular Friday night music, along with an expanded menu that includes fried clams and lobster rolls. Hey, it might be five degrees outside, but it’s all right to eat like summer didn’t end. Don’t be surprised if one or two friends show up to join Temple’s party. Saturday, Dec. 26: Pete Merrigan, Salt hill Newport – Pete just came back from a week in Florida, where he groused a bit about the rain, but reveled in the chance to do a Mad Beach Band reunion show in St. Petersburg. It’s always sunny when Pete plays, which is why I’m glad he’s now a permanent resident. He’ll be at après-ski parties in Quechee and Sunapee soon – how weird is that? Monday, Dec. 28: Coydog, Boar’s Head Tavern (Bromley) – I’ve never been much of a skier, but I’m a big fan of ski lodges. Hot toddies, comfort food, and music by a roaring fire – what’s not to like? Hailing from Southern Vermont, Coydog added new vocalist Ali Schelin in November. The band has an easy blues rock sound, and a growing catalog of rootsy original songs. Tuesday, Dec. 29: Dan Walker, Canoe Club – Back from the Rockies, with a new-ish (May 2009) album in town, Walker’s sweet spot is folk with elements of jazz and blues. He’s built a big Seacoast following, with a soulful singing voice and a habit of using his acoustic guitar as a hand drum. Wednesday, Dec. 30: Kerry Rose Band, Quechee Club – This is one of the many bands that counts Dave Clark as a member. Dave compares lead singer Kerry Rosenthal to Bonnie Raitt, and sees her as a real up and comer. The band also includes Jed Dickinson on harmonica and back-up vocals, Mike Gareau playing violin and guitar, along with percussionist Jaxson Morgan.